Go wine tasting in Sonoma and experience San Francisco on your own schedule with a 24-hour, hop-on hop-off bus pass, including two routes. 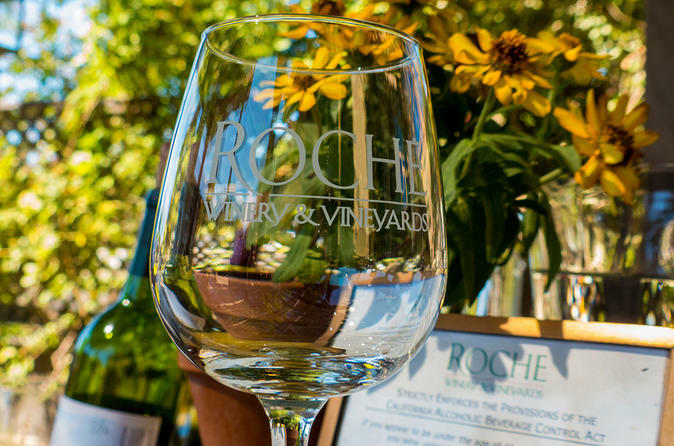 Taste the superb wineries of Sonoma Valley and the Carneros region on a 6-hour day trip from the city, which includes one wine tasting fee. Plus, enjoy the flexibility of 27 stops along a route through Fisherman's Wharf, Golden Gate Bridge, Golden Gate Park, Chinatown and Lombard Street and through charming town of Sausalito. Start with pickup at your San Francisco hotel. Anyone who enjoys a good glass of wine will appreciate this day trip from the city to the town of Sonoma and the world-famous Carneros wine region. Depart around midday from Fisherman's Wharf and head north across the Golden Gate Bridge by minibus, arriving at the Sonoma Plaza. You'll be guided to two or three unique Sonoma wineries which span from mass-production vineyards to smaller, boutique operations and tasting rooms. Wine tasting fee is included at one of these locations and you also may also purchase additional tastings at your discretion. After you sip and savor some delicious wine, relax on the return drive with drop-off from your starting point. This Pass combines two diverse tours on one value ticket. It gives you the opportunity to explore Downtown San Francisco, the world famous Golden Gate Bridge, and Golden Gate Park and Sausalito with unlimited hop-on hop-off use for 24 hours. You can explore San Francisco in the morning before the start of your wine tour, or simply use your 1-Day Pass the next day for hoping on and off the bus at any of the designated City Sightseeing stops to explore all major sights of San Francisco at your own pace. Live narration and multilingual audio tour guide is available. Listen current and historical facts on board, and snap photos of the view from the open-top deck. Buses depart every 30 minutes daily from 35 different stops, starting at Fisherman's Wharf.